The Pittsburgh Steelers defeated the Jacksonville Jaguars, 20-16, in Week 11 of the 2018 NFL season. It’s not how you start; it’s how you finish. For most of the Steelers’ dramatic victory, this was as bad as Ben Rothlisberger could look, as he made bad decisions and threw errant passes all game long. It’s a testament to the player that he is that despite putting out so much bad tape, he put all that behind him to get the Steelers in position to win. There’s no doubt that Pittsburgh is a better team with Marcus Gilbert starting. With the right tackle still out it was a rough showing for Matt Feiler, who struggled late in the game when he was left one-on-one. After a tough first half, the Steelers’ defense started to take over, and nobody did more to help this than Javon Hargrave who made a number of big plays rushing the passer and against the run. His sacks will make the highlight reels when he rightly earns a nomination for defensive player of the week, but his control in the run game in the second half was almost as impressive. While Jon Bostic had one of his weaker games of the year, the super active Vince Williams had a fantastic outing. His ability to attack offensive linemen and shed their blocks quickly forced plenty of redirection in the backfield, while his knack for winning his pass-rushes ensured that life was never easy for Blake Bortles. This was a game the Jaguars had no right to lose – but they did – due to their inability to move the ball in the air. Blake Bortles offered next to nothing as a passer, and once the Steelers realized this, they were able to key in on the run and limit the effectiveness of the Jaguars after an imposing start on the ground. One bright spot for the Jaguars came in the shape of the much-maligned left tackle Ereck Flowers. He was the victor in his matchup against Bud Dupree and showed a real nastiness in the run game. Is a change of scenery all he needed? This was the kind of day Jalen Ramsey will use to highlight his case for being the best defensive back in the NFL. He made life incredibly tough for Antonio Brown, and his two interceptions were about as pretty as you’re likely to see, and for very different reasons. The usually reliable Yannick Ngakoue committed a silly penalty and had a very quiet day rushing the passer. The Jaguars heavily rely on him for pass-rush, but the plays he made against the Steelers didn’t represent great production relative to how much he was on the field. Pittsburgh: When it mattered most, their big players made big plays to show their class on their way to a big win. 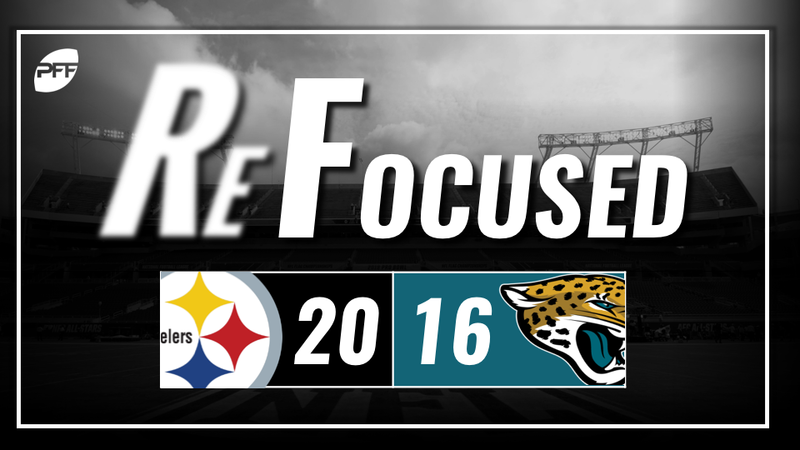 Jacksonville: Inability to move the ball in the air meant the Steelers could eventually focus in on the run game to shut the Jags’ offense down.